Can I use an existing outdoor light to run an outdoor receptacle? There are a few considerations to address before a proper answer can be given to this question. First, you must find out how many outlets (light outlets, receptacles, or combination thereof) are currently on this circuit, and what you plan to use the new receptacle for. If it is just a convenience outlet for small appliances, table lamps, or any other relatively light load, and assuming that we are working with a 15A circuit using #14 AWG wire, and if there is less than eleven (11) outlets on this circuit, you can add another receptacle. Next you need to find out how the circuit is wired. If there is a live power source in the light outlet as well as a switched conductor to control the light, then you can use the common neutral and tap into the constant power source in the outlet box so you have a live receptacle whether the light is on or not. If you don’t have a constant power source there, and only the switched conductor controlling the light fixture, then the receptacle that you add will only be working when the light switch controlling that light is on. The latter scenario here is the most likely situation. Now if these conditions permit, you next need to figure out how you are physically going to accomplish the addition of this exterior receptacle. Are you able to fish the wires inside the wall cavities to the location of the new receptacle for a flush-mount receptacle, or will you need to add a surface extension ring to the existing light outlet, facilitating some kind of surface mount system of conduit and outlet location? With every little home electrical project that you might be thinking of tackling, there are always factors to consider before proceeding. That’s why I’m here – to identify all of those additional considerations and to help you decide what is the best way to tackle the project. 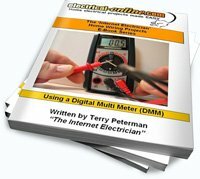 This entry was posted in Outdoor, Wiring-Videos and tagged DIY wiring, do-it-yourself wiring, electrical, electrical wiring, home electrical, home electrical wiring, home wiring, house wiring, outlet, outlets, receptacle, receptacles, wire, wiring. Bookmark the permalink.